Elisa is the hero of her country. She led her people to victory against a terrifying enemy, and now she is their queen. But she is only seventeen years old. Her rivals may have simply retreated, choosing stealth over battle. And no one within her court trusts her-except Hector, the commander of the royal guard, and her companions. As the country begins to crumble beneath her and her enemies emerge from the shadows, Elisa will take another journey. With a one-eyed warrior, a loyal friend, an enemy defector, and the man she is falling in love with, Elisa crosses the ocean in search of the perilous, uncharted, and mythical source of the Godstone's power. That is not all she finds. A breathtaking, romantic, and dangerous second volume in the Fire and Thorns trilogy. My Thoughts: Another intense novel by Carson. If you remember, I really enjoyed The Girl of Fire and Thorns even though I usually do not like historical. The Crown Of Embers is another adventure in Queen Elisa’s journey. She’s more confident than ever and is finally starting to believe in herself. She’s just learning the risks of being Queen and that everything has its power and price. Someone is out to kill Elisa and she’s not sure why or who. She can barely walk alone or eat with being a little bit nervous about it. Elisa goes on an mission to find the Perilous, its the source of the Godstone’s power. She needs it to really be able to rule and straighten the kingdom. Hector is still in the story which I loved and its more intense than ever between he and Elisa. There is a new character I really enjoyed. Storm. He’s mysterious and I loved getting to know him better. He made me laugh so many times. 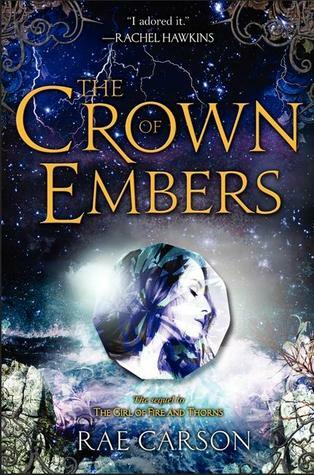 Man, oh man, The Crown Of Embers was very excited and kept me interested. I stayed awake a few late nights to read this one when I knew I should be sleeping. Overall: Cliffhanger! Man, I want the next novel now!!! So intense I wanted to bang my head against the wall! Gosh oh gosh. The Crown Of Embers was freaking fantastic. If you enjoyed the first novel, be sure to pick this one up as well. Cover: Like it. These are definitely worth picking up in the bookstore just by the cover alone.